Up to now, we just spoke about «filtering» coffeemakers… that mark the beginning of a long story. The pace will accelerate from now on, since we enter into a very prolific period in the story of coffeemakers, and the main action takes place in France. Under the impulsion of institutions like the Academy of Sciences,¹ the Arts and Crafts and the birth of the patent office, but also thanks to the influence of great gourmets (as Grimod de la Reynière and his « Almanach des Gourmands ») or influential figures, great inventors from the beginning of this century in search for the best and/or the most economical way to prepare coffee… the technology will rapidly evolve. 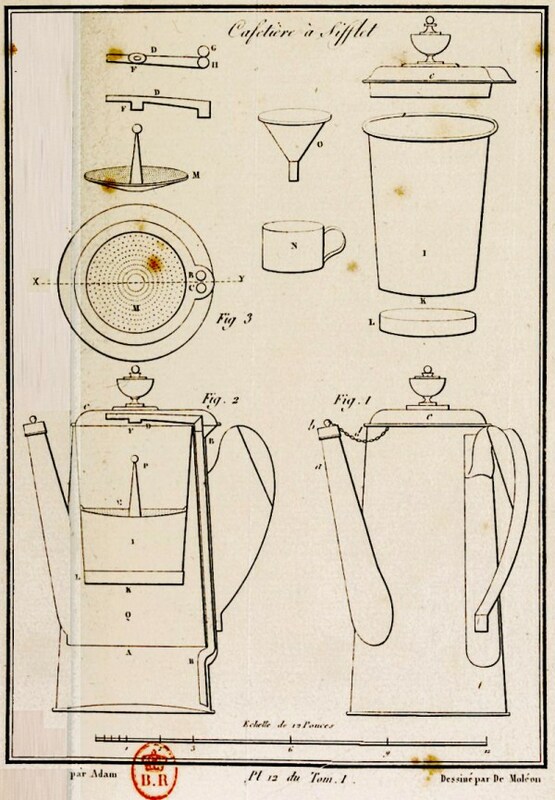 Between 1806 and 1855 (which means between Hadrot, with a revisited Dubelloy, and Loysel, with his monster percolator exhibited at the universal exposition), no less than 178 patents or improvement applications for coffeemakers were delivered in France. I will not review all these inventions (well, especially the last ones), but I will try to cover most of the important evolutions or crazy ideas that defines this journey, « from [a-] to [-zel] » (from Hadrot to Loysel). the «italian» coffeemaker… really ? Everybody knows that it is a French (Denis Papin) who invented the steam engine in 1690 and that his idea was used later by an English who took ownership of the invention… well, maybe not. It goes almost the same with the use of steam for the preparation of coffee. 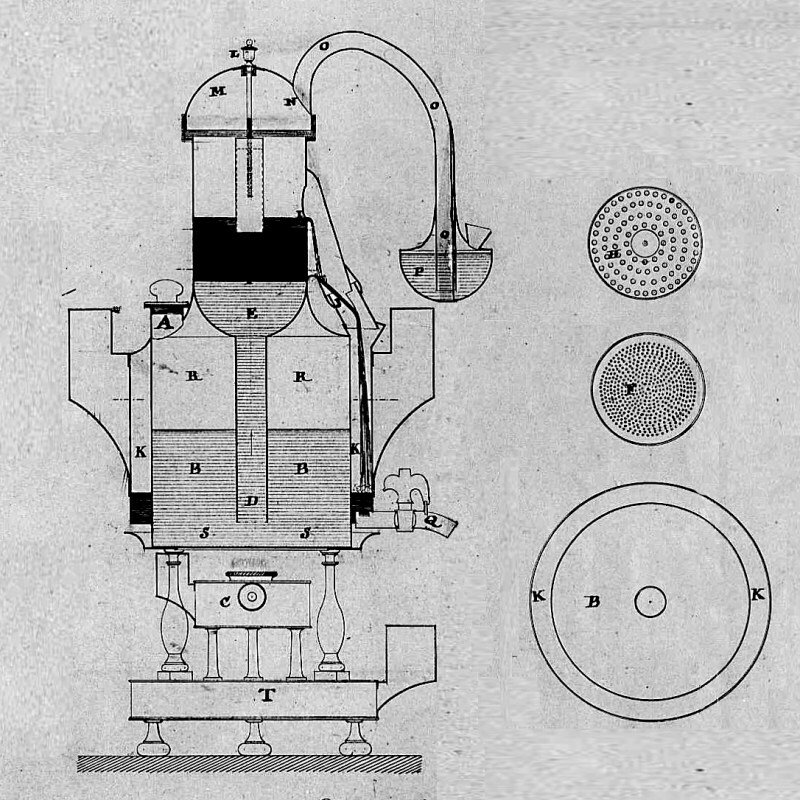 The century starts slowly with Hadrot, followed by Sené, both being tinsmiths in Paris, who present in 1806 and 1815,² two coffeemaker models that are nothing more than two revisited Dubelloy. – The first one, the « filtering coffeemaker without boiling water and air bath » from HADROT (tinsmith in 43, rue Saint-Sauveur) brings a small improvement to the Dubelloy with the use of material that are more resistant to corrosion than the tin plate used so far (by substituting it with toughen tin called « étain de Bismute ») and a conception that use a double wall (the said « air bath ») in order to obtain a better preservation of heat. – The « coffeemaker able to prepare coffee without boiling water, called Sené-coffeemaker » from Jean-Baptiste-Louis-Marie SENÉ (tinsmith in 31 & 32, passage du Saumon… well, well) is a kind of Dubelloy in kit, made of 5 pieces and three parts (the boiler, the filter and the coffee pot upside down) maintained together with bayonet closures and copper clips, in order to (if I understood it correctly because it is not clearly explained) flip the assembly when to water is hot and collect the filtered coffee in the coffee pot. It is the same principle that is proposed and improved few years later (in 1819 and 1820) by Jean-Louis MORIZE (tinsmith and lamp maker in 10, rue Boucher in Paris). It is also the principle of the « Napolitan » coffeemaker, that is still used nowadays, especially in Italy. 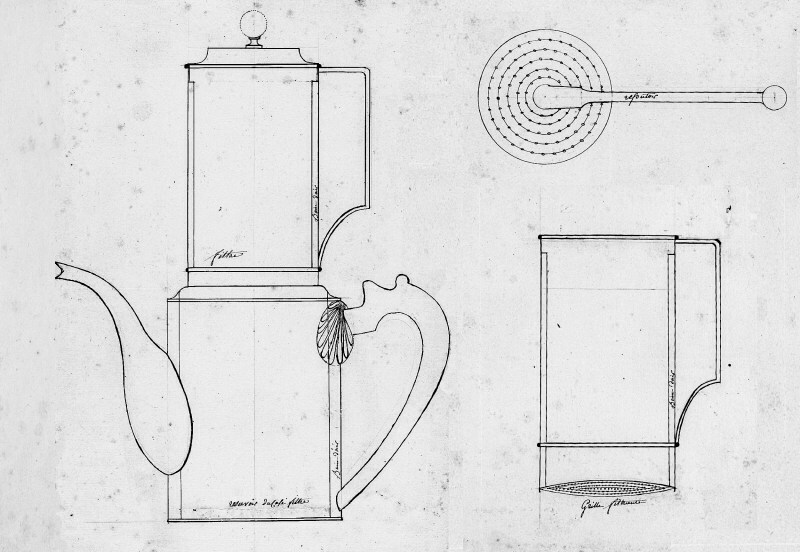 Things get more interesting with the invention coming from Joseph-Henry-Marie LAURENS (tinsmith in 31, passage du Saumon… really) with « a fabrication process for a filtering coffeemaker without evaporation » dated from 1819. He is the very first to use the steam force to push the boiling water into the upper part of the coffeemaker through a pipe. The proposed apparatus is sophisticated but still works with ‘soft’ filtration: the rising water is poured hot on the coffee powder, that is maintained between two grids. The coffee produced goes back into the a vessel and the end of the water passage is indicated by a whistle. a tube with a funnel shape effectively directs the rising water through the grind, but the extracted coffee returns into the container and can follow many cycles like that, through the coffee. This is presented as an advantage of the invention (and makes it the first « recirculating coffeemaker »). The coffee powder is kept within a box with grids and a cloth to avoid having the coffee grounds going through. 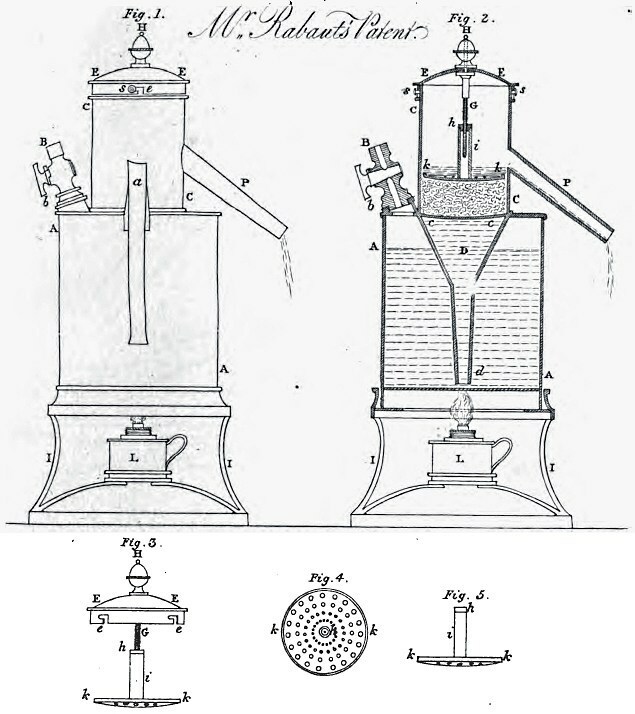 This conception is similar to the one proposed by André CASENEUVE (tinsmith in 6, place de Vannes, marché neuf Saint-Martin, Paris) in 1824, except that, in his case, the coffee goes into a second vessel, around the main boiler which present an hermetical closure and can be served through a tap (« coffeemaker called economical, preserving without evaporation the coffee aromatic principle »). The tinsmith and lamp maker were ahead of everybody up to this point, isn’t it strange? What were the engineers doing at this time ? 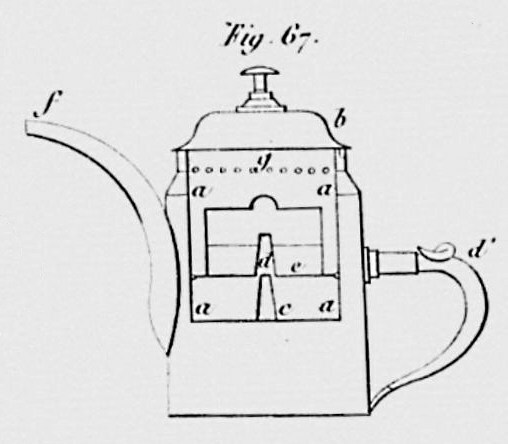 In order to find the true inventor of the Italian coffeemaker principle, we need to travel to England where Louis Bernard RABAUT (from Skinner Street, Snowhill, London) applied for a patent in 1822 entituled « Improved Apparatus for the preparation of Coffee or Tea ». What we have here is the first coffee pot of the « Biacchi » type, where the water pass through the grind pushed by the steam pressure inside the boiler and goes outside through a tube. 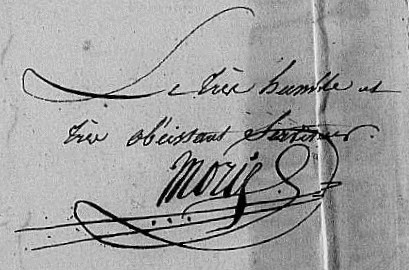 The honor is safe for France since Rabaut is a french expatriate… But since we are in search for the inventor of the application of steam force to the passage of water through coffee powder, we have to bow down before a German… and for that make another step back in time. Elard RÖMERSHAUSEN is a theologian, philosopher, preacher and German inventor from the beginning of the XIXth century, having in his bag many inventions related to the application of steam. 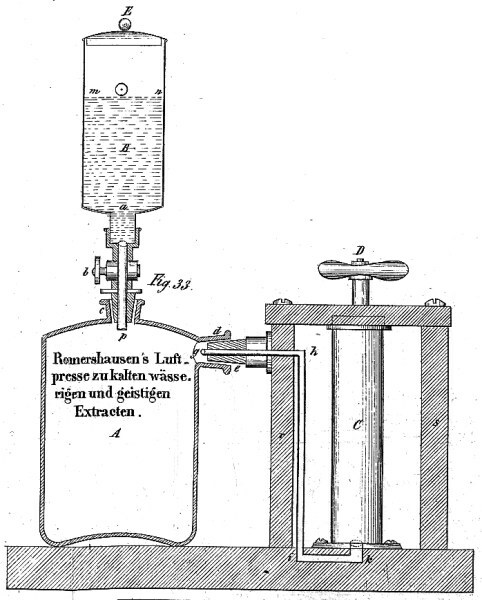 As it is reported in another later paper from the Polytechnisches Journal, « Die Benutzung des Luft- und Dampfdrucks zur Extraction organischer Substanzen » (Volume 105, No. 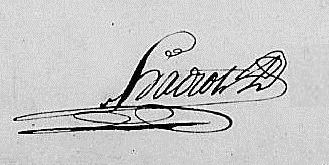 XLIX., p. 176–183 de 1847), another of his invention present similarities with a rudimentary portafilter (… but fixed) and s close to an expresso machine in this sense. 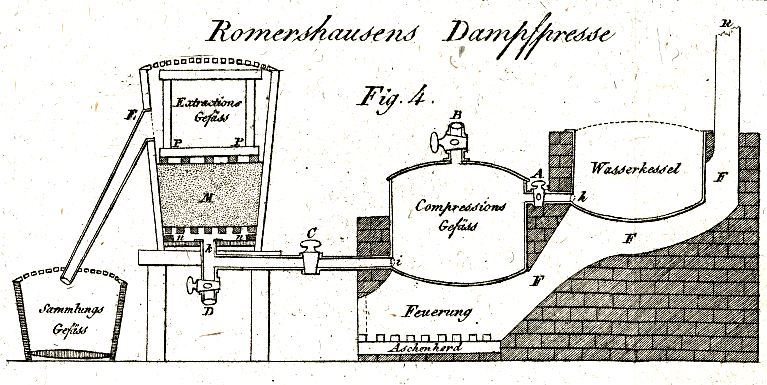 In this invention, the coffee is placed into a circular vessel between a grid and a kind of filtering paper, placed at the output of the apparatus (and not between two reservoirs as on the other coffeemakers). The water being put to boil with this output oriented upward, the whole coffee maker was flipped as soon as steam started to come out. Water was hence force through the grind and coffee was pouring outside from the ‘portafilter’. It is sure that, compared to espresso, the water was warmer and the extraction pressure was only slightly higher than 1 or 2 bars… but this principle is very similar to the first Express coffee machines, and well ahead of his time. It will take about half a century to find another invention as close as this one from the expresso machine. 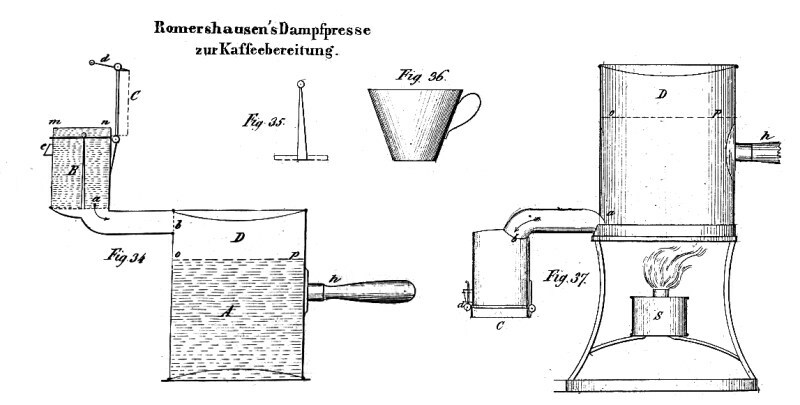 His other invention (I’m talking about the « Luftpresse zu kalten wässerigen und geistigen Extracten », a liquor extractor for domestic use) was also ahead of his time and we can imagine that used with a very fine grind and a nearly boiling water, it could produce an elixir very close to the ristretto. This extractor use vacuum created inside a vessel with a manual pump and use this suction to extract essences from vegetal substances in solution. The extracts pass through a filter before falling into the vessel A. In the particular cas of coffee, it was advertised as being able to produce a coffee extract for traveling, to which it was only necessary to add some warm water to obtain a «real» coffee. There is also a large scientific documentation on chicory, « coffee substitute », studied and used during the continental embargo imposed by Napoléon. ² The technical evolution of ways to prepare coffee was also influenced first by the taxation on colonial goods from 1806, then by the continental embargo up to 1814. 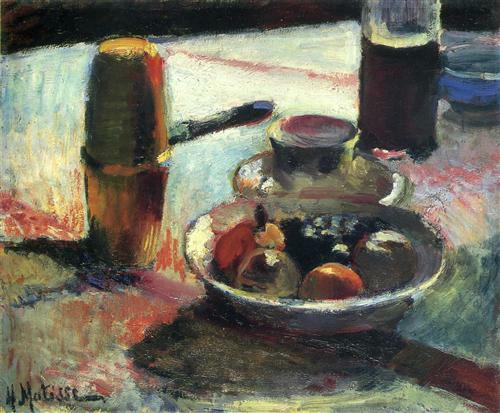 During this period, the importation of coffee in France were completely stopped. Which may explain the blank gap in the inventions between 1806 and 1815, and their acceleration just after. 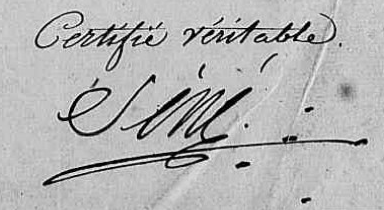 ³ Source: « Archives INPI », with their kind authorization.